We have grown this rare Scilla from eastern Turkey for more than 30 years . It lives in our bulb frame but is certainly hardy. Short spikes of intense blue flowers and wider leaves than S.sibirica. These delightful bulbs grow in the woods of N Spain where they grow with fritillaries and wild daffodils. Delicate candles of soft blue flowers. The bulbs are rather like a lily- hence the name. Easy in sun or light shade. Clump forming and never a problem! One of the best late-flowering species with extraordinary triangular heads of rich, almost glowing blue flowers which arise from a basal rosette of wide leaves. From S Spain, not Peru! They should be planted a sunny, warm position. Almost evergreen. We move them now when they are virtually dormant. 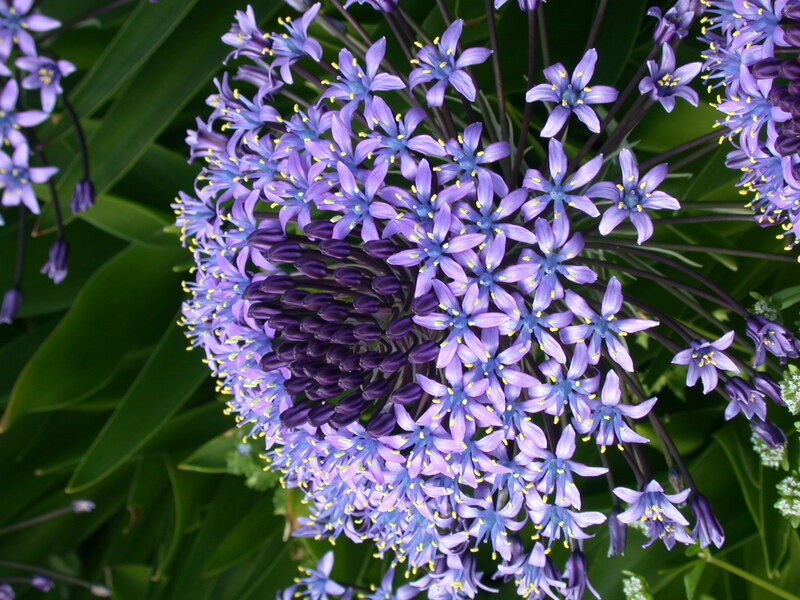 This is the finest form of this late-flowering species with extraordinary triangular heads of rich, almost glowing blue flowers which arise from a basal rosette of wide leaves. It is like a S. peruviana on speed. They should be planted a sunny, warm position. Almost evergreen. We move them now when they are virtually dormant. This is our Farrer Medal winning plant which is hardy but grows best under glass. The flowers never achieve quite such huge proportions outside. The leaves are wider than S.peruviana. Distinct. the bulbs need to be left undisturbed to acheive their full potential.